When MONDVOLLAND was formed in 2006, the musical emphasis was firmly orientated towards folk, but now, with two releases behind them and the completion of their sophomore full-length album, the band has very clearly developed and expanded its sound and direction to become an atypical Black Metal band that occasionally nods in the direction of avant-garde and post metal, but whose melodies are clearly defined and whose sound is immediate and accessible. 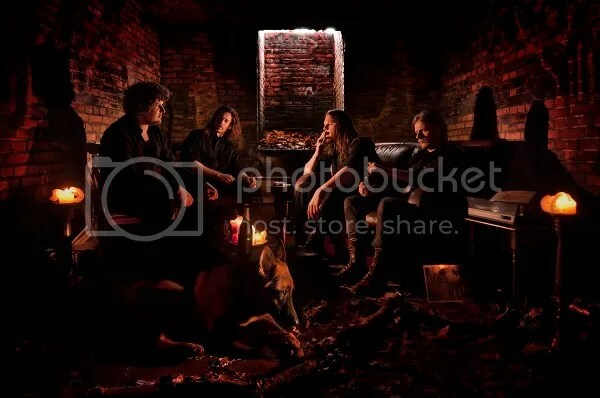 Add to that vocals that are a mix of screams, deep grunts and varying styles of clean vocals, and you have a band that moves seamlessly and expertly through a number of extreme metal genres. The new seven-track album, for which a label is currently being sought, will be called “Kwade Vaart” and was recorded at the E-Sound Studios by Asher de Vries (FLUISTERAARS), while mixing and mastering is by MONDVOLLAND bassist/vocalist Mickeal. The title is the modern Dutch equivalent of “quade vaert”, which translated means “wicked” or “evil” journey”, and is inspired by local folk stories that explore the subjects of poisoning, death in battle, fratricide and witch hunts. The band’s name itself is taken from the Dutch “mond volland”, meaning “mouth full of earth”, and comes from a local folk story that recounts how giants created the hills of Montferland in the Gelderland region of the Netherlands, the home of the band’s original founders. “Kwade Vaart” will be the third release from MONDVOLLAND, whose lineup comprises Mickeal (session live musician in HEIDEVOLK, APOPHYS, SEMISTEREO) on bass and vocals, MJWW (WEDERGANGER) on guitar and vocals, Nico on drums and Bauke (AM TUAT) on guitar. The band’s first full-length album, “d’Olde Roop”, appeared on Apollon Records in 2010 and has since sold out. This was followed in 2012 by the 3-track EP “Pestvogel”, in both digital and CD format.